Welcome to SAC’s ARBchek Resource Center. Please feel free to view our online Demo Videos below, designed by the Securities Arbitration Commentator. The ARBchek demo will give you a clear understanding of how to use the ARBchek search application to research your Arbitrators. 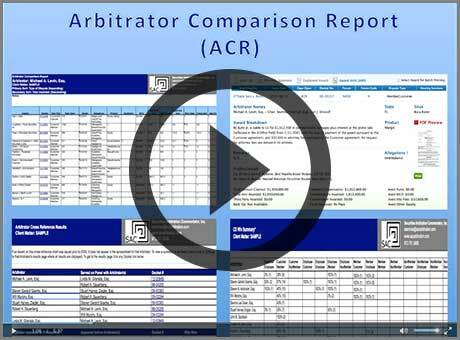 The Arbitrator Comparison Report (ACR) Demo will show you the benefits of upgrading your ARBchek report to the ultimate due diligence research tool, and how to order an ACR report. Please ‘share’ these Demo’s with your colleagues. In this video, you will learn about ARBchek, the most comprehensive database available for researching an Arbitrator’s Award history. With ARBchek, you may search 55,000+ Award records, viewing the results in summarized, easy-to-read chart formats. 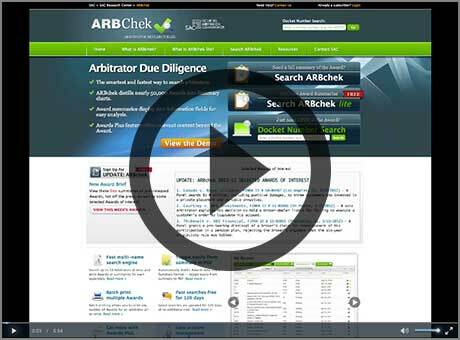 ARBchek’s powerful search tool is the first step in your securities Arbitrator Due Diligence research. In addition to our online ARBchek system for streamlining arbitrator Award histories, we now offer the Arbitrator Comparison Report (“ACR”), our deluxe tool for evaluating your arbitrators. The ACR takes due diligence analysis to the next step, providing data and calculations as to an arbitrator’s overall win rates, recovery rates, records on expungement grants/denials, potential conflicts with other arbitrators and counsel, and more, all delivered by email. Take 5-minutes to view the demo and save hours in the end. Copyright © 2019 Securities Arbitration Commentator, Inc. All rights reserved. The following applies to FINRA Awards only: Copyright 2013 Financial Industry Regulatory Authority, Inc. All Rights Reserved.